Yesterday I had the honor of talking to some 15 or 20 members of the Swiss Open System User Group. I like talking to experts because you always learn something from them, and yesterday was no exception. As part of the introduction, we talked about why projects fail, which brought us to the question, "what is a successful project?" We talked about market acceptance, achieving the technical goals of the project, and customer satisfaction. But, as I learned from the participants, there is also personal success in the project. "The project is a success when I enjoyed working on it". This aspect is often severely challenged in the crunch phase before project release (particularly when management is standing around looking for someone to motivate). A motivated developer is at least twice a good as that same person when s/he is demotivated. Afterwards we talked about numerous topics, including the quality in software. How much quality does a project need? How do you assure quality? What is the role of an automatic test suite? I like the analogy of a test suite being like scaffolding on a construction site. The scaffolding helps you build the building. It provides safety and security. It actually goes further, because it provides an 'as-built' documentation, which can be used to assure that future versions of the software conform to the behavior of the current version. So, like when renovating a building, step 1) build the scaffolding, step 2) do the renovation, step 3) remove the scaffolding. You don't build the scaffolding after you've finished the building. You need it to build the building properly. (This explains partly why it is difficult to get management to authorize developing tests suites after the software is running and largely completed -- the building has been built!) It also underlines the importance of building the test suite as you build the product. Hans Merki goes a step further. He believes that the test suite is more the foundation of reliable software. For truly reliable applications, e.g. real time applications which a) have to work and b) in which recreating a error case after the fact is simply not possible, there is no substitute for designing quality into the product. In this case, self tests and logging and an ability to replay events can be critical to the success of the product. The "devil's square" (also "devil's quadrat") attributed in various places to someone named Sneed (but I haven't been able to find the original source, or even his/her first name -- can anyone give me a pointer to the source?) 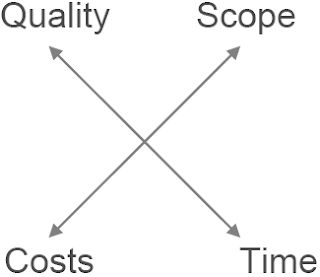 shows the relation between Scope, Quality, Time and Cost. Scrum teams also create a formal of definition of done, which is negotiated with and agreed to by the product owner. This is the first approximation of the quality standard. But as Hans points out, the quality standard is also a requirements issue which impacts the fundamental architecture. So the quality standard should be consciously adopted in the process of creating the product. BTW - The slides to my presentation, "Project Management with Scrum - what, why and how" are now available online. Help! I'm Trapped in a Waterfall! Thought of the day: The Lean Definition of Done. Looking for an Agile Job or Contract?